North Redwoods Book Arts Guild: LET'S MAKE A SPIDER BOOK! No worries if you have arachnophobia because this workshop does NOT involve creepy crawly hairy critters. The Spider book is a structure featured in Hedi Kyle's new book, The Art of the Fold. Dianne Byington will lead the workshop. The Spider Book has expandable space between pages to allow for added content. Dianne says it makes a nice little album and is fun to make. To construct our prototype we will use 65 lb. cardstock to create a 75% scale model. All the pages are scored multiple times. You may use your favorite scoring method: clear gridded ruler, measuring rules (metal spacers), ruler or templates with your choice of an embossing stylus or pointed bone folder. The book is finished with a basic pamphlet stitch on a triangle spine. People wishing to decorate, embellish or fill pages using their favorite creative media are welcome to stay at the meeting longer. 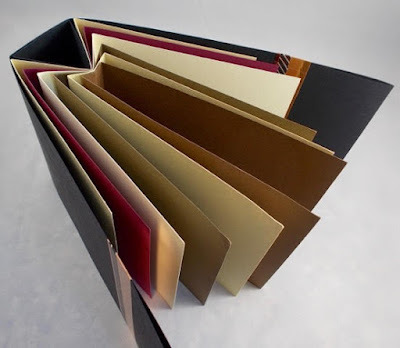 6 pieces of cardstock, any color(s), for pages, 4 1/4" x 11" folded in half to size 4 1/4" x 5 1/2"
1 piece cardstock for spine, 4 1/4" x 6" folded in half to size 4 1/4" x 3"
OPTIONAL DECORATIVE ITEMS: rubber stamps & stamp pads, collage material, washi tape, colored pens/pencils, etc.